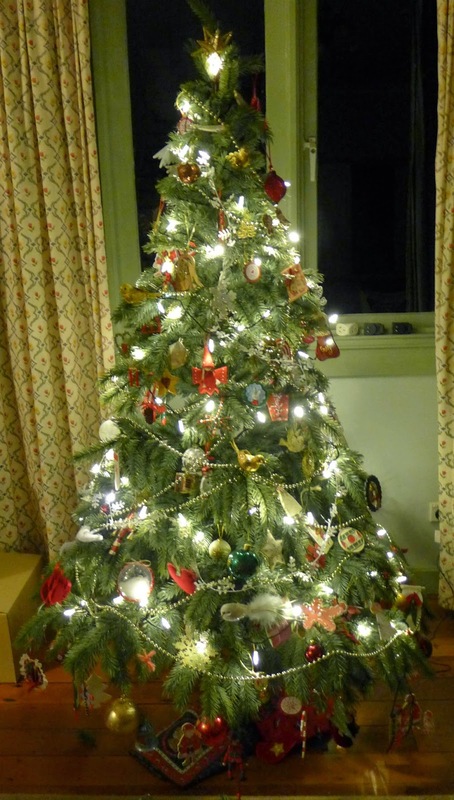 A Woman of Notes: Christmas Tree Lights - warm or cool white? 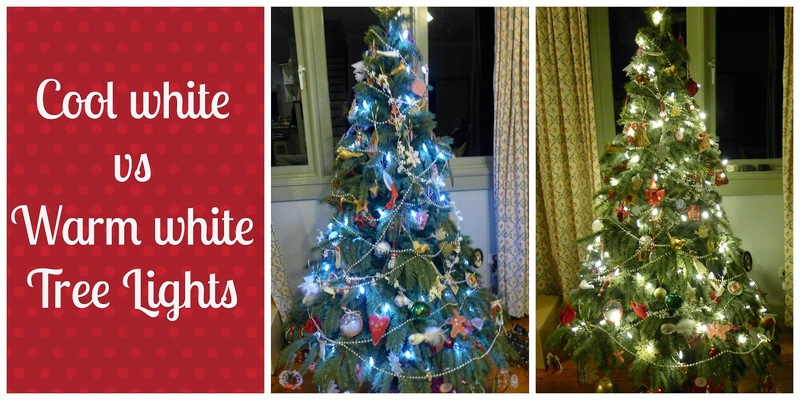 Christmas Tree Lights - warm or cool white? to put up the Christmas Tree. But, oh no, one of the sets of tree lights didn't work! was the only good night to put up the tree for some time. cool white lights, so I bought them and hoped for the best. The new lights are bright, and sparkly, but I was disappointed. Our ornaments are red, gold, white and cream, and the very blue cool lights just weren't doing it for me. I tried to be content with them. Because people all over the world are suffering all sorts of hardships and I'm fussing about Christmas tree lights.... but every time I looked at the tree, the lights bothered me. So today I shopped again, in the daytime, this time at Target. Oh joy, I found warm white lights, 100 on a string, and on special! Tonight Emily and I extricated the cool white lights from under the hundreds of ornaments and beads (no easy task) and put the warm white ones on instead. And we've ended up with more lights, which I always wanted. The whole tree seems lighter. The white of these lights ties in much better with our ornaments, and gives a sort of golden glow. So I'm one happy girl. I think they would be great with a blue or turquoise colour scheme, and with silver. Perhaps I'll even find a new home for them. It's late here, and it's been a hot day. Christmas beetles are kamakazi-ing around the room. It's just started to rain, quite heavily now. 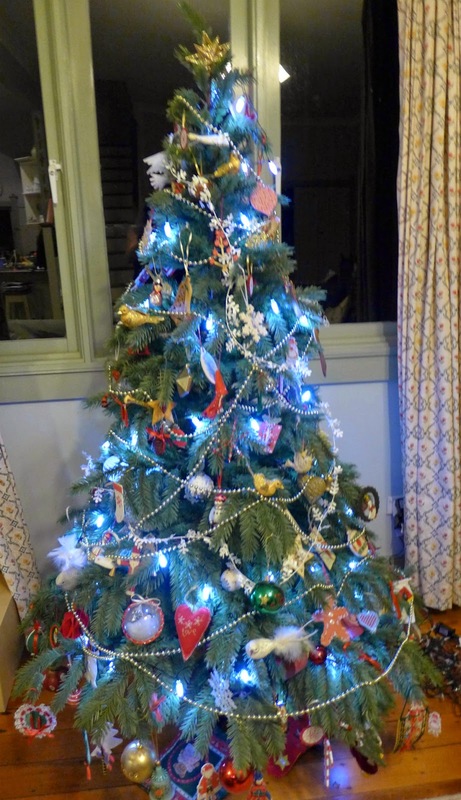 I've spent some of today making the house Christmassy, and the rest teaching and rehearsing music - my recorder class is playing at the school carols night tomorrow; I had some recorder and piano students come for lessons, and tonight I rehearsed with a cellist who I'm accompanying for an exam on Saturday. Tomorrow friends are coming for lunch. How has December begun for you? Great minds think alike, Amy! I hope you enjoy your preparations and tree, too!